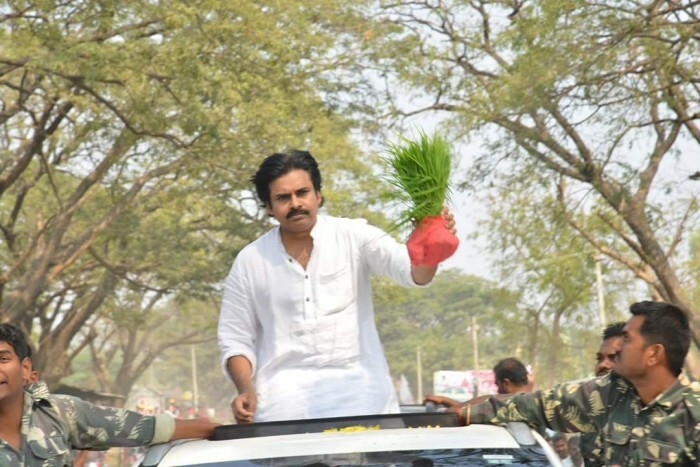 In these pics, an animated Pawan Kalyan can be seen leading the ‘Jana Sena’ brigade and laying the groundwork for the political war that lies ahead. If you are a fan of the much-loved Pawan Kalyan, then we have some terrific news in store for you. In a truly exciting development, some pics from his rally in Khammam are creating quite a buzz on the social media and that too for all the right reasons. In them, an animated PK can be seen leading the ‘Jana Sena’ brigade and laying the groundwork for the political war that lies ahead. We are sure that these pics from the rally will grab plenty of attention from the political fraternity. 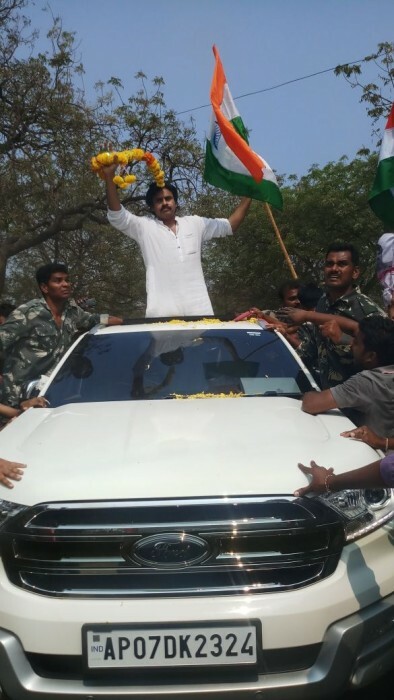 In case you did not know, the ‘Power Star’ is currently on a 3-day political tour through which he hopes to get things in place for the upcoming elections. Well, we wish PK good luck and hope that he finds success in political endeavours. Interestingly, PK had recently said that he is grateful to his fans for making him a star and would try to repay them by entering politics. “I’ve always wanted to do something good and give back to the society. I believe I’m able to achieve that through cinema and politics. When I started my career, I told my family I’d do 10-12 films. Post Kushi, I thought of doing five more films and calling it quits because I wanted to serve our nation. But, the love of my fans has made me do 25 films,” he had added. On a related note, Pawan Kalyan’s latest big screen outing ‘Agnyaathavaasi’ has proved to be a let-down at the box office. Released around Sankranthi, it opened to a good response open day 1 but collapsed in no time. To matters worse, critics too panned it mercilessly. With his political career taking shape, PK may not do a film in the near future. However, he is still to take a call on this matter.